This may technically be a sequel, but it’s not one that absolutely requires you to watch the first. I recently watched The Trip, the first of this pair, and I encourage you to read my review if you haven’t and/or can’t watch it but are interested in watching the second. 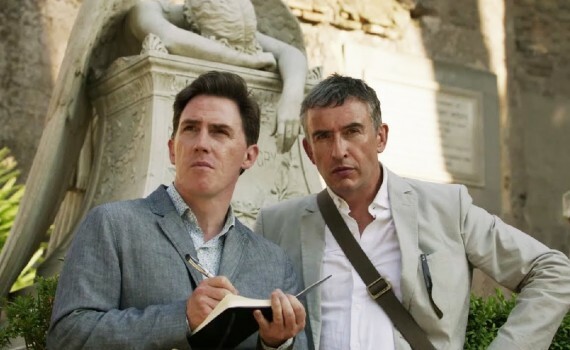 But a quick introduction; The Trip is a comedic improv film starring Steve Coogan and Rob Brydon in which they play themselves. There is some structure and fictional elements to the story, but mostly it’s just these two guys poking fun of themselves, each others, Brits, and fancy food. It’s clever & organic humor that’s both entertaining & relaxing, requiring nothing of audience members except a love of English-style comedy. The Trip to Italy is not much different of a movie, either in content or excellence. Steve & Rob are back for another round of the dangerous job that is spending time together. The media outlet that asked them to tour some restaurants in Northern England now wants them to team back up and go to Italy, write a few more reviews, and report back on the culture they experience there. Sounds nice; an all expense paid trip to Italy, food & wine, great history, perfect weather. And for two of England’s most hard-working comedic television presences, it’s a nice gig to pick up in between paying jobs. But these two aren’t exactly chums. They’re partly rivals, partly friends, partly colleagues, always one-upping, forever trying to impress, and this journey just might be another long, tough road trip. As with the first film, you’d better enjoy this style if you’re gonna love this movie. It’s British humor, sometimes witty, sometimes slap happy, but always off the cuff and mostly of the insult variety. Steve & Rob are masters at voices, impressions, quick jabs, and ABBA lyrics. They make the movie fun with their actual personalities, playing it all up of course, but generally being themselves on a paid vacation that’s being filmed for our benefit. But beyond the humor is a little extra something that makes this film great. There’s a heart here, or a realism, something that feels a little sad & honest, and it appears early but doesn’t manifest itself fully until the end of the film. In both of the duo of films, director Michael Winterbottom finishes his projects off with a subtle bang, with quiet moments that almost bring you to tears. It’s not easy to finish off a quality story, but Winterbottom has talent, Coogan & Brydon have chemistry, and this movie works just as well as the first.